March 15, 2010 March 16, 2010 - by Anna Ward - 3 Comments. Copyright; photo by flickr user Horia Varlan. This article is the result of a collaborative effort between Quad writer Anna Ward and Dean Baker, co-director of the Center for Economic and Policy Research in Washington, D.C.
How much will $675,000 get you? That amount of money will buy you an additional 19 semesters at BU (and at least three more degrees), a medium-sized house in an affluent area, about six Porsches, 33 badonkadonks — or, if you’re Joel Tenenbaum, thirty songs. Like many students, Joel Tenenbaum, a BU graduate student, shared and downloaded music on his computer. Unlike many students, he got caught. Last summer, a jury sentenced Tenenbaum to pay the steep fine as punishment for violating US copyright law. Sharing data over the internet has become more and more commonplace – so is this “business as usual” for the entertainment industry? Historically, the institution of copyrights traces its origins back to the feudal guild system. By granting temporary monopolies to producers and creators, copyrights provide incentives for the continued production and innovation of creative and artistic work. In the digital age, however, the exclusive right to intellectual property is becoming increasingly difficult to enforce. Through peer-to-peer networks and specialized software, virtually anyone with an internet connection can swap and trade massive amounts of data, including the music and video and text protected under copyright law. 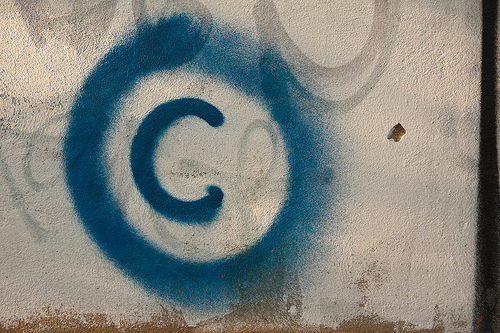 In order to enforce copyright, states are beginning to rely on increasingly invasive forms of repression such as monitoring civilians, seizing property, and leveling huge sanctions against nonviolent lawbreakers. In one such case, a lecturer at the Polytechnic University of Valencia (UPV) was censored after speaking at a conference on the legal use and benefits of file-sharing over peer-to-peer networks when dealing with copyrighted works. The dean of the university, under pressure from the Spanish Recording Industry Association as well as the Motion Picture Association of America, tried multiple times to prevent the conference from occurring. When his efforts failed, the lecturer was asked to leave his teaching position. It’s easy to disregard these cases as extraordinary or unusual though – after all, these are situations that don’t affect the everyday student who downloads the newest Joanna Newsom album to save an additional $30. So how does copyright law affect the everyday lives of law-abiding citizens? The answer is simple: higher prices. The price of academic textbooks is a prime example. Publishing companies routinely release “new” editions with few significant changes from previous editions. Students who try to sell their books back to their school’s bookstore get burned when they find that the “new” 16th edition of their textbook has just been released, and so the book that they bought for over a hundred dollars is now worth about ten. Most textbooks also have “international” editions, which are actually just exact copies with paperback covers that come at a fraction of the price. These “international” copies are forbidden from being sold directly in the U.S., but a recent Supreme Court ruling made their re-importation completely legal, spawning a cottage industry of online re-retailers. Despite this, textbooks prices have skyrocketed, growing at twice the rate of inflation for more than two decades. And it’s not because the cost of paper is going up. Publishing companies, using their “new” and “international” gimmicks, are simply taking advantage of the market power that comes with their copyright. The system of intellectual property leads to curious outcomes in other markets as well, particularly the market for prescription drugs. Pharmaceutical companies endlessly search for new drugs they can market to patients and doctors. But if a competitor develops a successful medical product, companies will frequently invest in “copycat” research in order to produce their own version of the drug. According to the Food and Drug Administration, more than two-thirds of all new drugs fall into this category. There’s no reason for such redundant and wasteful research. For example, research could be supported with public money, much like we do already through the National Institutes of Health. If the results of these research projects were placed in the public domain, we would all benefit from newly developed drugs that could be sold as generics for $4 a shot. The same goes for textbooks. A competitive grant system would work well in academia, where professors could be enlisted to produce educational texts that would be available to the public at large. This would also encourage academic freedom by allowing professors to pick and choose chapters from different textbooks in designing their coursework. For music and movies, we could envision a voucher system whereby people could be compensated for their work as musicians and artists and filmmakers. Individuals could use their voucher to support the musician(s), writer(s), or other creative work of their choice. Since they get paid through the voucher system, all their work could be in the public domain, free for everyone to download. The point is there are other ways besides copyrights to foster innovation and compensate people for creative work. These alternative mechanisms are more cost-effective and likely to produce more creative work. Copyrights may have been a good way to support creative work in the medieval age, but it is time that we develop a mechanism that is more in tune with the modern internet age. Dean Baker is currently the co-director of the Center for Economic and Policy Research in Washington D.C. He writes a weekly column for the Guardian Unlimited, and his blog, Beat the Press, features commentary on economic reporting. His analyses have appeared in many major publications, including the Atlantic Monthly, the Washington Post, the London Financial Times, and the New York Daily News. He received his Ph.D in economics from the University of Michigan. They didn’t have copyrights in the medieval age. Copyrights, like other individual rights, are a product of the enlightenment.